I have developed a seed habit. 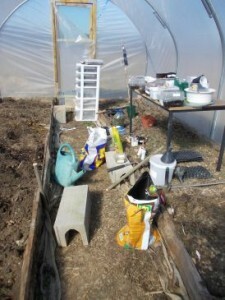 Now that we have the polytunnel with its raised beds, at long last we have the space and a suitable environment to get plants started. 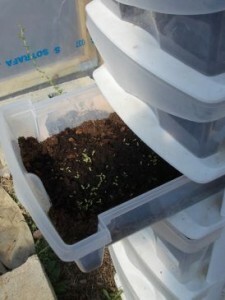 Up to now we’d fill every windowsill or other exposed flat surface in the house with seedtrays and collections of yogurt pots to grow them in. Invariably at least one lot would get knocked down and there’d be potting compost over computers or printers or books, and another lot shoved in a corner would get forgotten about … but no more. I can plant seeds to my heart’s content now. And Ruadhri’s. He announced not long ago that he’s going to be a naturalist when he grows up. I think he’ll be tending towards the botanical end of that specialty as he really does enjoy growing plants. So if there’s a display of plant seeds in a shop somewhere, that’s where I’ll be. Today we hit Bricomarché for yet more copper piping and a hedgetrimmer – the old one literally fell apart last autumn. Oh yes, and large sacks of tenor allegro for our disappointingly non-reproductive sheep (so far …), and maize and basse cour (farmyard) mix for the carp. Chris was looking for something or other useful and boring, so I sidled off to the seeds.There was a good selection. 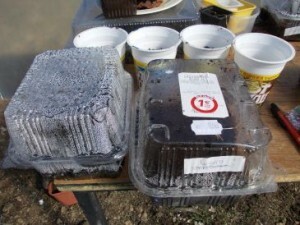 Three or four varieties of pumpkins, tomatoes, haricots, beetroot, peas, lettuces and so on, and twelve varieties of radish. I kid you not. There were a dozen different sorts. They take their radishes very seriously here in France. Rors has them at least once a week at school, usually with butter and salt. I haven’t quite got into that, but I like a radish in a sandwich with ham or cheese. It would be fun to try all twelve sorts, but since a single pack contains about a zillion radish seeds, it could take a while to work through all of them! 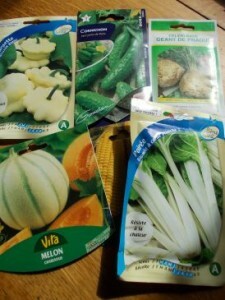 Here’s what I bought today, each pack costing about a euro, apart from the sweetcorn which was a whopping fiver. And none of these are things I’d have dreamt of trying to grow in Ireland, apart perhaps from courgettes. But not courgettes like these – they’re top left in the photo. I got them because they were so peculiar looking. It was only when I got home I noticed it said that they ‘taste like artichokes’. Now, this is stange. Why would I want courgettes that taste like artichokes? Wouldn’t I just rather buy artichokes? If I want to grow courgettes, then presumably that’s because I like courgettes with their courgetty taste? Never mind, they’ll be fun to try. Melons, celeriac and gherkins – not only would I not have grown them in Ireland, I don’t think we ever ate them there. They were too luxurious. 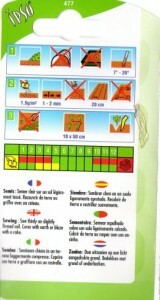 Seed packets vary enormously in helpfulness. Some have long descriptions of the plant in question and how you should grow it, what you can do with afterwards and how you can become a better gardener. They’re the exception though. The norm seems to be a series of unintelligible pictures like these ones that I think are telling you how to plant the seeds, but a lot of the time have angry red crosses over them i.e. telling you how not to do things. Totally puzzling! So the polytunnel is filling up with plants in the beds and recycled seedtrays on the potting table. I’m also using a wobbly set of plastic storage drawers as incubators and they’re working very well. My intention is to knit some reusable, appropriately shaped vegetable row markers but by the time I sit down in the evenings these days, I’m too tired to pick up my needles. There’s a lot going on outside. I’m making do with scribbled on stickers for now, not as classy but practical.